Owen and Jules Passey’s journey to creating Smartbarf began when they started raw feeding their first dog, DJ. She had shown little interest in the dry food her breeder used, and despite trying many other brands, she remained under-weight, and people often asked if she had recently been rescued. She was also having to visit the vet frequently, with runny eyes and itchy skin, which were diagnosed as due to allergies and therefore incurable. And then there was her poo’s!! With their scientific backgrounds though, Owen and Jules were not content to just leave DJ to suffer. They had many questions and therefore began to research all the possible causes and remedies. DJ’s lack of appetite suggested that her diet might be a factor, so it wasn’t long before Owen and Jules started to explore raw feeding. The change in DJ was nothing short of miraculous! She immediately started to enjoy her food and, gained a healthy weight. Visits to the vet became a thing of the past, as did those awful sloppy smelly poo’s! 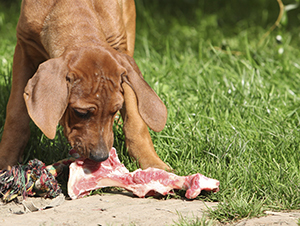 Seeing the huge difference that a diet of raw mince meat, chicken carcasses and bones was making, Owen and Jules were convinced that good nutrition was the key to a happy healthy dog. So they also began to research all the vitamins and minerals needed to optimise a dog’s diet. They were soon adding chopped raw vegetables, fruit and other ingredients to the meat and bone, which DJ loved, and she became a picture of good health. When Lily joined the family she had terrible body odour, but with a diet of raw food, this quickly disappeared. It was when Lily also joined the family, that Owen and Jules started to struggle with buying, storing, chopping, weighing and serving all the different vegetables, fruits and other ingredients needed to provide all the vitamins and minerals. 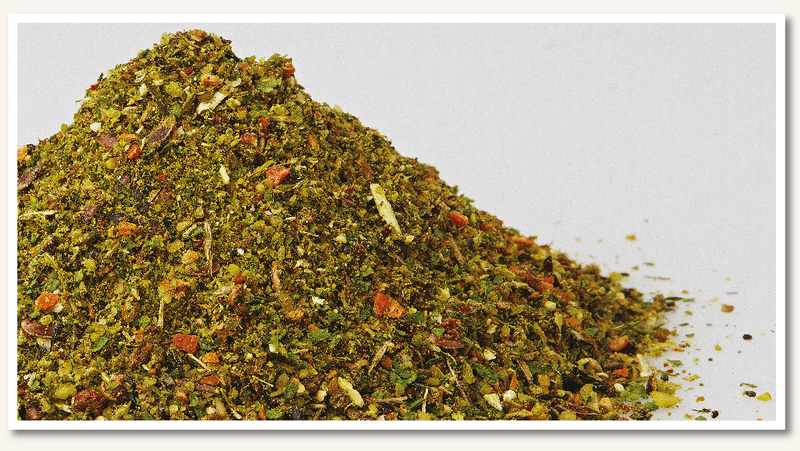 So after a great deal more research, and working closely with suppliers specialising in the various ingredients, they finally achieved their “eureka” moment – all the nutrients were there, in a consistent mixture, with a long shelf life, and at an affordable price – SmartBarf™ was born! 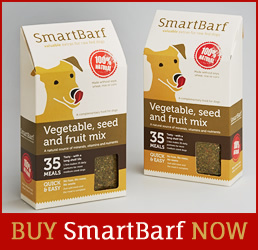 Today, thousands of dogs and their owners benefit from the nutritional boost and the convenience which Smartbarf provides. Why not try it for yourselves? You can order from our website for UK delivery by clicking here, or you can visit one of our Stockists in the UK and other countries here.